This is a beautiful Texas style outdoor kitchen in Humble, TX. The design was custom tailored for this homeowner, and was based off of a texas style design. Everything in this photo is made of only the highest quality materials. The tile floor and bar are a personal favorite of ours, and blend in perfectly with the surroundings of this outdoor kitchen. All appliances used in our outdoor kitchens are stainless steel.This is for quality as well as eye appeal. Everything that we build at Houston Outdoor Kitchen Pros is only of the highest quality and we put 100% into every customer and their project. 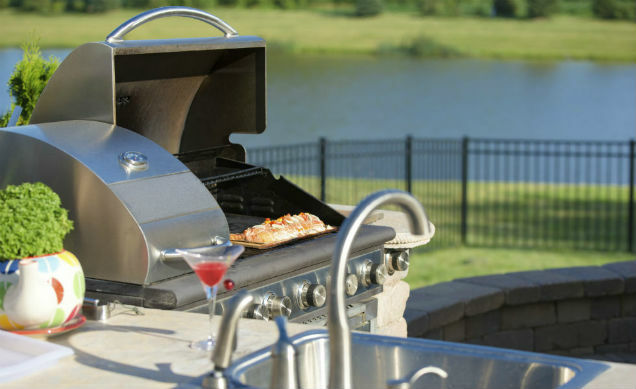 We guarantee that every customer will be given full individual service to ensure they have a great outdoor kitchen. Contact us today for a free consultation. We will make our texas style outdoor kitchen from a dream into a reality today!